Many unique phenomena, which do not have any rational explanation are unfolding at the Spiritual Research Centre and Ashram and we have been conducting spiritual research on them. True spiritual research can only be conducted through the medium of an advanced sixth sense. This means that to be able to fully capture and understand the various attributes of a phenomenon, an advanced sixth sense ability is a must. Physical attributes show only a small part of the actual story. At the Spiritual Research Centre and Ashram, we have seekers who have this subtle ability and are able to explain the subtle process underlying phenomena. One of the ways in which the seekers share what they perceive in the subtle is through pictures based on Divine knowledge. These pictures help to visualise and explain many intricate details and nuances of phenomena, which are impossible to understand at the physical level or with any man-made machine. For example though we take the help of some biofeedback machines such as Polycontrast Interference Photography (PIP), Thermal Imaging and the Lecher Antenna, they are limited in their ability and are at best able to show just the fringes of the full complexity of the spiritual dimension and its involvement in an event or phenomenon. Even so these instruments are important as they do provide tangible evidence that corroborates what seekers can see visually in the subtle. 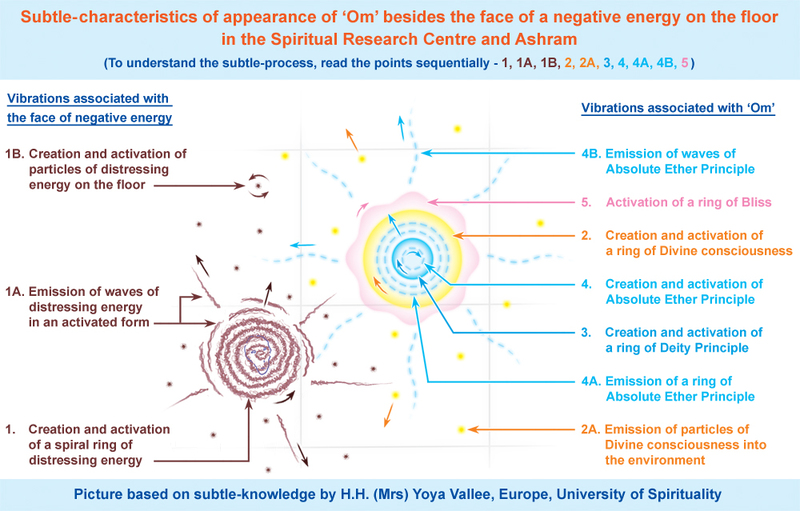 Our spiritual research team studied the spiritual phenomena underlying the widespread appearance of the Om symbol in the Spiritual Research Centre and Ashram. In this article, we present two pictures based on Divine knowledge drawn by H.H. Yoya Vallee. 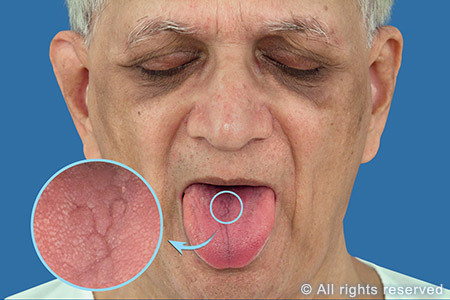 The spiritually pure Om symbol appeared on the tongue of H.H. Dr Athavale, Founder of the University of Spirituality in 2011 and is a sign of the high spiritual purity of a person. The Om is visible till today (4 years later)! The first subtle picture explains this phenomenon, i.e. when the Om symbol appeared on the body H.H. Dr Athavale (a Saint and Guru of the highest order). It explains the impact on the surrounding environment and how it bestows immense spiritual benefit. The various spiritual vibrations have been numbered to explain the sequence in which they were seen. While we see only the Om sign, in the subtle dimension, vibrations of Bliss (Ānand), Absolute Ether Principle (Ākāshtattva) or the highest Cosmic Principle, Divine consciousness (Chaitanya), Divine Energy (Shakti) and the Deity Principle are generated in the Om sign and emitted from it. One of the reasons why this happens is because H.H. Dr Athavale is constantly engaged in guiding seekers towards God-realisation and working tirelessly for over 3 decades for the establishment of a Divine Kingdom on Earth. Such an expansive mission is blessed by Deities and their Principles are activated as per the need of the mission. The colours of the vibrations perceived are specific to the spiritual vibration associated with it. For instance the colour of Divine consciousness is yellow. The process described above takes place continuously and spiritually purifies the environment. 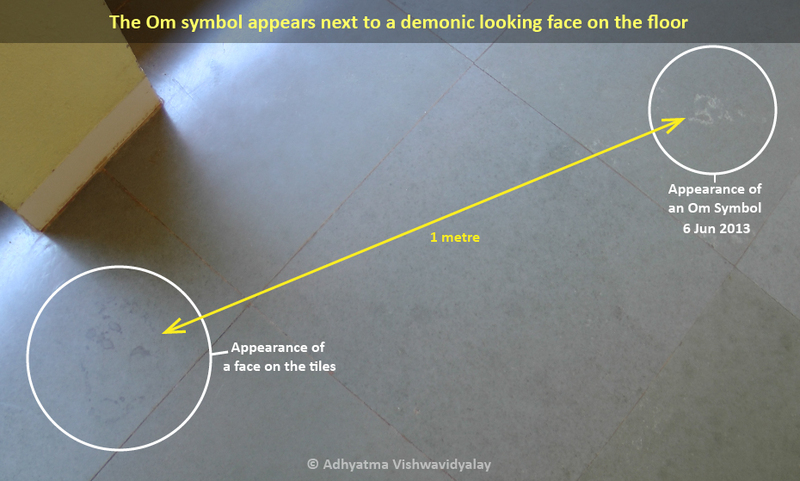 For those who are familiar with the phenomenon of pareidolia (seeing faces in things), an impression of a face emitting negative vibrations appeared on the floor in the corridor adjacent to the Art department at the Spiritual Research Centre and Ashram. This was due to a negative energy attack. Within a short period of time on 6 Jun 2013, an Om symbol appeared next to it. The spiritual reason for the appearance of the Om symbol on the floor was to counteract the negativity from the face. The second subtle picture (shown above) displays the unique subtle characteristics of the Om symbol, which appeared next to a face of a negative energy on the floor. In the subtle it was seen that distressing vibrations were being emitted from the face of the negative energy. However, it was being countered by the positive vibrations emitted through the Om sign. 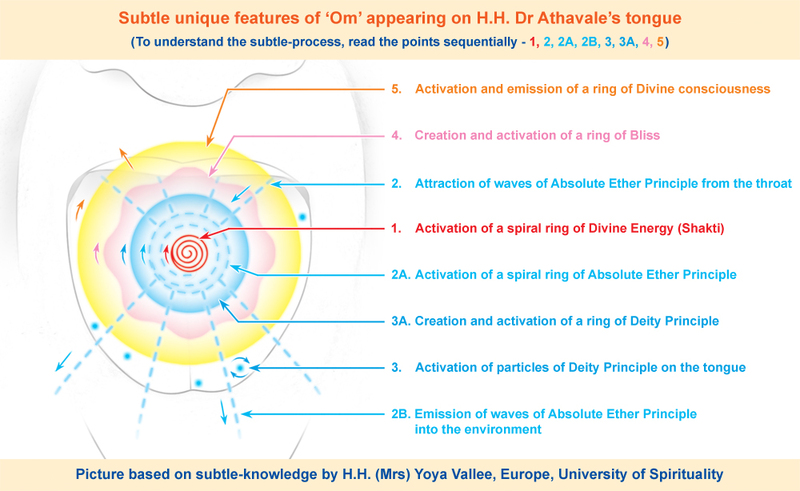 One of the vibrations emitted from Om symbol that appeared is of the Absolute Ether Principle, which is the strongest of the Five Cosmic Principles and helps to nullify the negativity. This is an example of how when a positive sign like Om appears, then in the subtle, it continually purifies the environment and disintegrates negativity. These pictures based on subtle knowledge also increase our awareness about the spiritual benefit we receive when such a spiritually pure symbol as the Om symbol appears in our home. Through such pictures, when we are made aware of the positive vibrations in a visual manner and understand the process of subtle cleansing that happens automatically just by the presence of the symbol, our reverence towards the Om sign also increases. This article gives a glimpse of how a phenomenon has many complexities in the subtle dimension as opposed to the gross dimension, which shows only a fragment of the actual event.